with details and photos of rarely seen factory options. 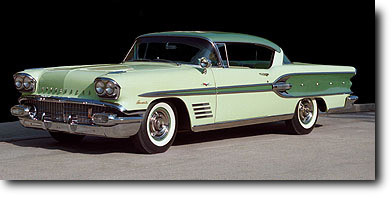 The 1958 Pontiac Bonneville Sport Coupe is undoubtedly one of the flashiest of all 1950's cars. 1958 was General Motors' 50th Anniversary "Golden Jubilee," and the designers pulled out all the stops with the Bonneville. Introduced as a low production convertible late in the 1957 model year, the new Bonneville series was expanded to offer a top-of-the-line coupe and convertible in 1958. A unique one year only body showcased longtime GM styling chief Harley Earl's final statement before his retirement. Chrome literally dripped off GM's entire 1958 lineup. Wild two-tone exterior color combinations and extravagant interiors adorned every '58 model from Chevrolet up the GM ladder to Pontiac, Oldsmobile, Buick, and Cadillac. "The Boldest Advance in Fifty Years!" My Bonneville is a 100% bone stock, no compromise body-off restoration of a rust-free car. Everything works as new. It's loaded with most every available factory option, including Rochester "TriPower" triple two-barrel carburetors with correct vacuum actuation and authentic air cleaner, and ice-cold factory air conditioning. A very special option on this car is the extremely rare inside sliding Plexiglas sunvisor. Also ordered by the original owner were "Wonderbar" AM radio with automatic power antenna, power windows, power steering and brakes, Pontiac accessory spotlight/mirror, "Memo-Matic" power memory seat, Safeguard speedometer with excess speed buzzer and warning lamp, Pontiac compass, Autronic Eye automatic high-beam headlight dimmer, reel-out trunk lamp, spinner hubcaps, pop-up rear seat armrest, and deluxe factory floormats. In order to maintain an attractive low base price and increase dealer profits, everything from a glove box light, back-up lights and even the "Full-Flow Oil Filter" were listed in numerous "option groups" in the dealer sales catalog. The engine compartment is authentically detailed. The exterior is two tone Calypso and Burma green with a dazzling matching interior. Chrome plating was done to the highest standards. 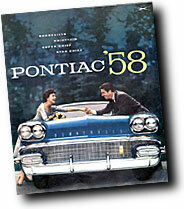 Very few reproduced parts are available to restore 1958 Pontiacs. I searched for years seeking nearly impossible NOS parts including correct GM mufflers and resonators, authentic Delco spiral shock absorbers, Guide lenses, grille, even NOS brake and accelerator pedals! This Bonneville looks, drives, and sounds like it did when it was delivered to its original Colorado owner in 1958. No expense was spared, time was not an issue - the only goal was to achieve an authentic, showroom-new 1958 Pontiac Bonneville. 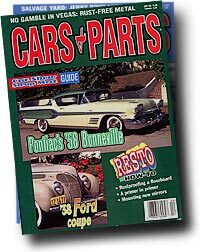 My Bonneville appeared in a 2-part article in "Cars and Parts" magazine April/May 1998.
click the Pontiac emblem to check out more cool '58 Bonneville stuff ! After you finish the Bonneville pages, check out Kris's "King of the Road" home page to see my other classic cars and view my pages about the early days of color TV broadcasting! Thanks for visiting my Pontiac website!